Over this first year of parenthood, we’ve quickly learned that anything we can do to stay rested is essential. But we also realize moments of rest are a small miracle. Self-preservation can be very hard to come by. When we chose to use my Care@Work Backup Care benefit, we didn’t have an emergency care situation to contend with - but we had reached a point in life where we felt spread too thin. 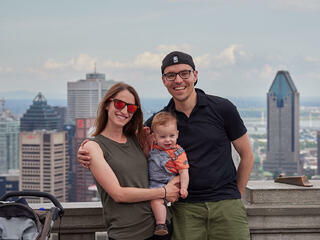 I admit, even though my everyday work is focused on delivering the best possible user experience for Care@Work’s Backup Care, when it came to actually using the benefit for our own son, my wife Rachael and I felt hesitant. We were skeptical if bringing an unfamiliar face into our care equation was really going to work for our family. also took on a fixed schedule of night shifts so she could have as much time as possible during the day with him - consistently, week to week. We have a part-time nanny in place to help with the gaps in coverage and to enable my wife to rest up a little on the days after her night shifts. But even with what seems like a great care plan in place, she is often left exhausted. We decided that we’d use my Backup Care benefit when she needed it most - to give her an extra day of rest and a chance to get some time things done for herself and the family. We agreed on a day this summer - a day of the week before Rachael went in for one of her usual night shifts to help her get ahead of the exhaustion. I submitted our request using the Backup Care app on my phone in just a few minutes time. Before the day was over, we were notified with details of our matched caregiver: Annie. Our backup care day arrived. I had chosen to work remotely from home, and as much as I know about the quality of Care@Work’s Backup Care service, both Rachael and I felt concerned about the changes to Julian’s routine. I wasn't sure if I'd be able to be productive, and if she'd really get the rest she needed. Annie arrived at our house and within 15 minutes, we were put at ease. We chatted about her family, her brother who is a firefighter in town and her childhood in a military family. She was so relatable, so engaging and so confident in the job she was there to do. Rachael and I conferenced quickly in the other room while she played with Julian. We were surprised by how quickly we both trusted her. Our son was in good hands and we both had the restful and productive day we were hoping for. As part of the product team at Care.com, I know our product inside and out. I know what goes into every part of creating a quality Backup Care experience; what is happening at each stage behind the scenes, and at every step as the user walks through the process. But walking in the shoes of a user, as a parent needing care myself, made all the difference in personalizing that professional, logical perspective. After my experience with Backup Care, I felt good about the experience we’ve created for users and identified areas where we could innovate more. What I felt most proud of was that I could understand the meaning and value of this benefit firsthand. We often hear about our clients and their employees experiencing an “Aha moment” after they use Backup Care for the first time. Now, I had my own. Backup Care provided quality care for my son, allowed me to be present at work and enabled my wife to rest and catch up on life. But the benefits extend far beyond that. The mental and emotional well-being of my entire family was being cared for, too. I’ve always wanted to do work that helps people – that is of service, and working toward the greater good. It’s a large part of why I pursued a Master’s of Science in Nursing earlier in my career. While enrolled, I got firsthand, clinical experience in acute and critical care settings. It changed my life forever. And the caregiver persona will always be very near and dear to me. I appreciate what it takes to subvert your own needs and well-being to put those of someone else first. Being a parent has certainly deepened that understanding. Working in the tech and software sector for eight years now, it has been hard to find a company in the industry that delivers a product or service rooted in helping the greater good. But at Care.com, things are different. It’s personal – on so many levels, and that’s what makes it so special. Care@Work by Care.com is one of those rare technology companies whose mission and service are directly linked. I look around at my colleagues, from diverse personal and professional backgrounds, all experiencing their own individual care needs - while delivering on the care needs of so many others. I’m proud to be part of a team that is working together to improve the lives of families and caregivers by connecting them in the best, most reliable ways possible. My family included. Gabe Shore is part of the B-to-B product team at Care.com, where he helps develop and manage the Care@Work suite of products and services, leading clients to greater awareness and usage. Prior to joining Care.com, Gabe held several senior product management roles at Optum Labs at UnitedHealth Group, LogMeIn and salesEQUITY. Gabe lives outside Boston, MA, with his wife, Rachael, and their son, Julian. This post is part of a series authored by Care.com employees, where they share firsthand experiences using Care@Work benefits, and reflect on the impact it’s made on their personal and professional lives.